Four time Olympian, Frank Havens (1923-2018) died July 22, 2018, just days before his 94 birthday. Frank Benjamin Havens III, 93, husband of the late Kay Easling Havens and a resident of Harborton, VA, passed away at his residence. A native of Arlington, VA, he was the son of the late William D. Havens and the late Ruby M. Nothey Havens. He was a United States Army Veteran and retired insurance adjuster. He finished in 1948 as a Silver Medalist and in 1952 as a Gold Medalist and remains the only American Olympic Gold Medal winner in a singles canoeing event. 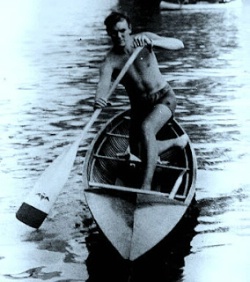 He is an honorary life member of the Washington Canoe Club, member of the U.S. Olympic Team, U.S. Olympic Alumni Association, the 1999 American Canoe Association Legend of Paddling Award Recipient, Virginia Sports Hall of Fame, Arlington Sports Hall of Fame, and Washington and Lee High School Sports Hall of Fame.